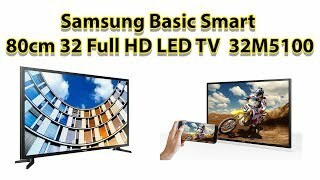 The lowest price of Samsung Basic Smart 80cm (32 inch) Full HD LED TV(32M5100) was obtained on April 23, 2019 3:39 am. This is best tv at this price.✓ Full Hd : crisp n clear display with good contrast and color reproduction.✓Basic smart Screen Mirror : My one plus 3t screen mirroring works flawlessly. But this feature may depend on mobile. Also this TV doesn’t have any pre-installed apps like full fledged smart TVs. Hence its called basic smart.✓ 2 Way Audio Mirroring : You can connect your mobile audio to tv and vice versa. Best feature.✓Dolby Audio : you can notice the surround sound while watching live sports or a movie.√ Value more money. Go for it. !! in this range best tv luvd it overall perfect…. Great picture clarity as expected by Samsung. Checked for this product in Reliance and Croma and 40 inch Samsung was at Rs.60000 there. This is a great value product by Amazon in offering this product at Rs.41000. Really great picture clarity and resolution. Has mutiple connectivity options of HDMI. The panel looks really premium and great in my living room. Nice TV in this budget range. TV received with decent packing by Amazon, thanks for that faster next day delivery. Wall mount installed the next day of delivery by Samsung engineer, thanks to Samsung.Loving the TV in terms of the picture quality and sound. Indian Cinema mode is superb.I can connect my mobile Mi max to tv screening comfortably.I could easily connect my wireless bluetooth headphones (Intex) by pairing and watch tv online without disturbing out.Good TV, U can go for it. Its a great product and a reasonable price. Good picture quality and great menu/settings options. Easy to operate. Only the issue I have noticed is related to the sound. Sometimes the speaker gives some noise/echo for few of the songs/movies. May be its issue with the telecast or limitation with the speaker. But, Speakers can play music at the great clarity and bass normally. Overall great experience. Using in my 20 X 20 room and its a great to watch this. Highly recommended.